I like football. This is surprising because I generally hate watching sports on teevee. I don’t know if its the tight-ends or the hairless arms, but football is a-okay in my books. Every Sunday, we dress baby Otis in his football onesie and have football family time. My friends love a good ol’ fashioned food competition, so I thought, why not host a soup competition for superbowl. Get it, Soup-erbowl. Turns out I’m not that genius and grantland hosted the king of all head-to-head souperbowl competitions online days after I had sent out my invite. Superbowl custom dictates chili eating, so I decided to forgo the opportunity for soup supremacy and take myself out of the running by making a venison chili with skillet cornbread. I used up some of my black beans (thus continuing to fulfill my new years resolution) and used some fantastic Deer Valley venison from the Brickworks market. I wanted to be on theme, so I made Brooklyn based Baked’s tomato soup cupcakes with mascarpone icing. The batter was a horrifying shade of orange from two whole cans of tomato soup, the finished cupcakes were…Mmmm wow…unexpected…moist, spicy, tomatoey – genius! Our friends are so impressive – almost everyone brought soup, with garnishes! Fancypantses. 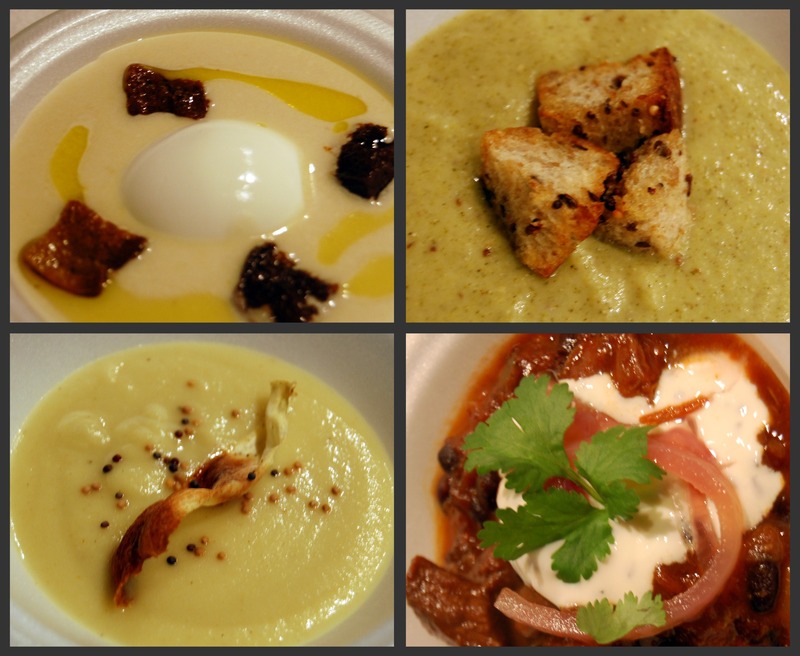 There was a creamy cold “tailgate” vichyssoise with croutons and a perfectly soft boiled egg from Ferran Adria’s new home-cooking book, a parsnip soup with toasted mustard seeds and parsnip chips, and a 101 cookbooks cheddar broccoli soup with crispy croutons. We each tried the soups and had a secret ballot drawing at half-time – the winner by a landslide was the “tailgate” vichyssoise, oh and that creepy slackline dancer. 1) Preheat oven to 400F. Grease seasoned cast-iron with shortening. 2) Combine flour, cornmeal, sugar, baking powder, cheddar and salt in a bowl. 3)Combine wet ingredients and add to dry ingredients until just combined. 4) Place empty cast-iron pan in heated oven for 5 minutes. 5) Remove and pour batter into pan. 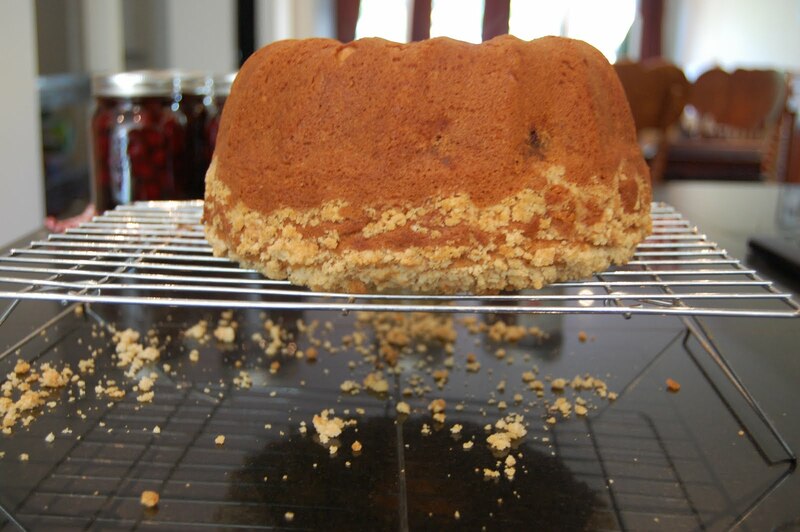 6) Bake for 25 minutes, let stand 15 minutes before serving. 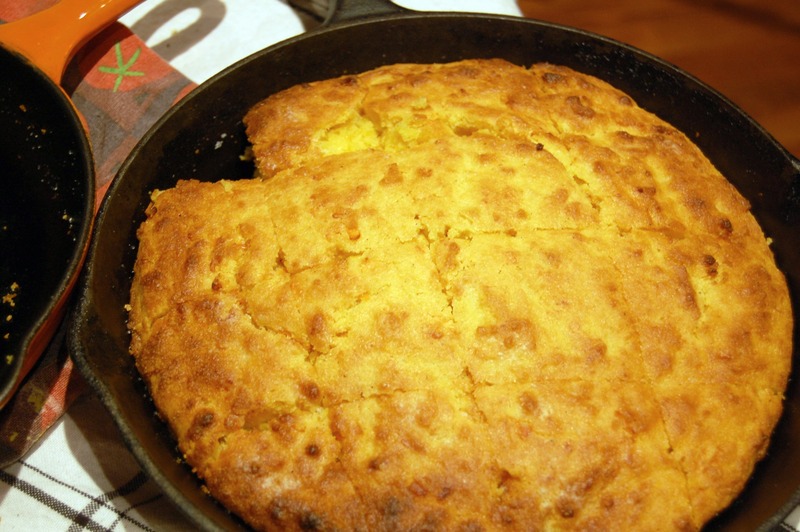 *I like to top cornbread when it comes out of the oven with a maple syrup butter sometimes. You know, to gild the lily. Christmas is almost here! In my house, baking starts today. Sugar, flour, eggs, ginger, sprinkles and vanilla are about to explode all over my kitchen. Vanilla is the cornerstone of any great baked good, a hint of flavour or a booster for other flavours. In June, inspired by Jacqui, co-founder of the Cross Country Baking Club, I started my own batch of vanilla extract. 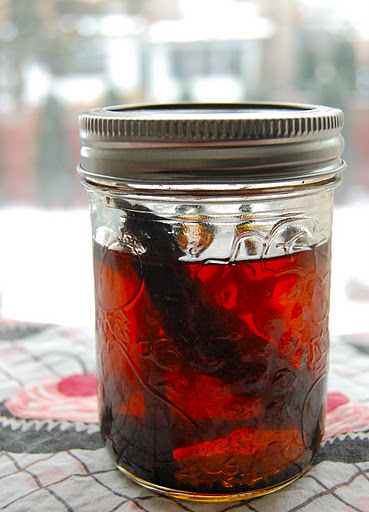 It is extraordinarily simple to make your own vanilla extract and a great gift for the bakers in your life. December 2010 – Vanilla Extract! 1. Cut vanilla beans lengthwise to reveal seeds. Cut into 1.5 inch pieces. 2. 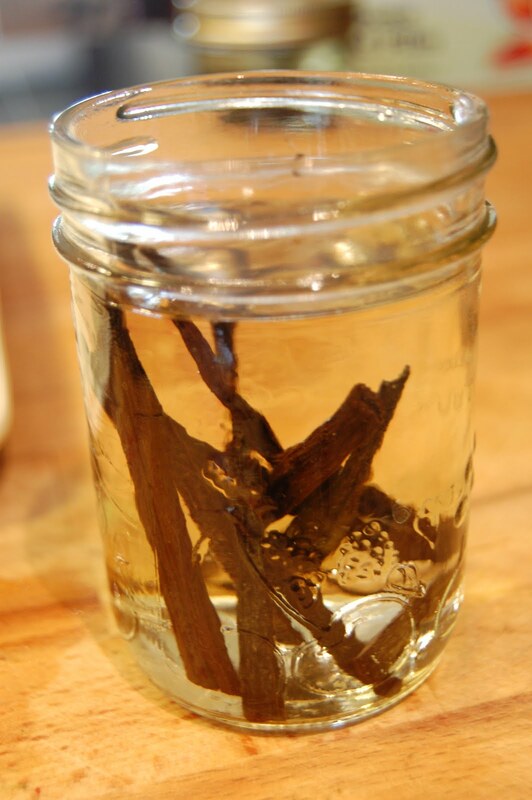 Place vanilla beans in sterilized jar. 3. Top with alcohol of your choice. 4. Tighten lid and wait 6-8 weeks, until alcohol has changed colour and vanilla has steeped. Yield: One cup vanilla extract. 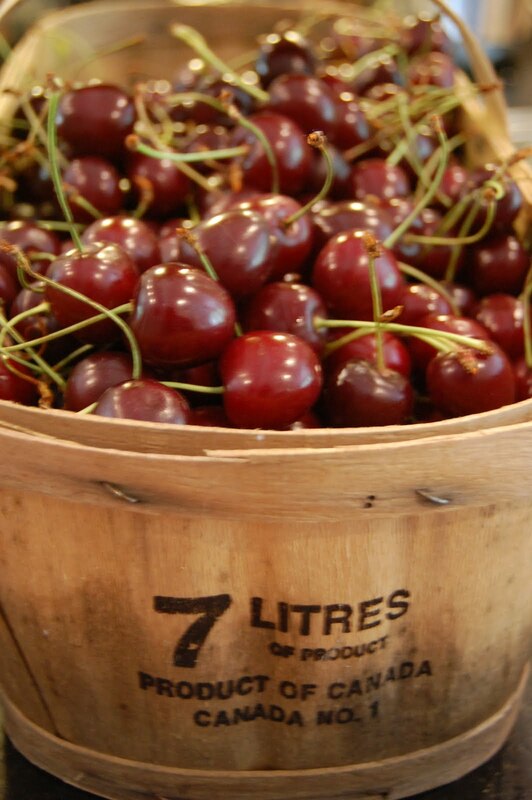 I could not resist the 7 litre bushel of cherries at the farmers market. Who could? 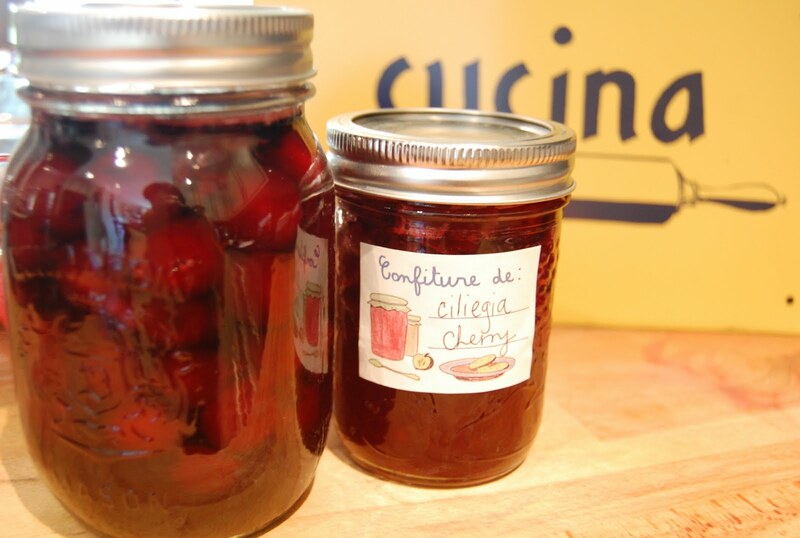 After gorging on cherries and suffering subsequent tummy aches, I decided to preserve some of them to enjoy later. Guess what? 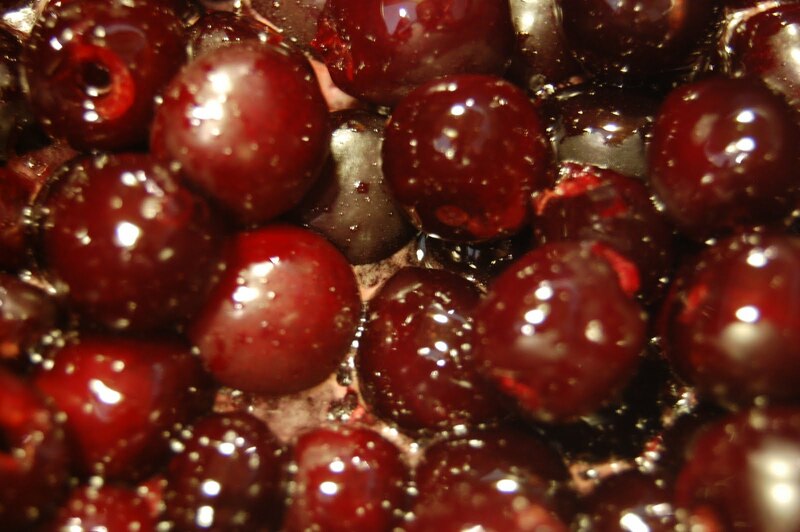 Pitting cherries, even with my handy-dandy cherry pitter, is no…bowl of cherries. (…groan?) 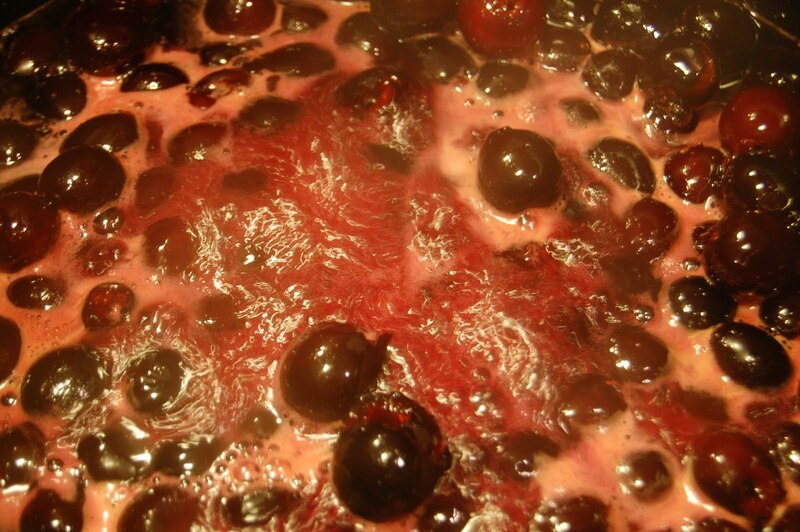 I am covered in cherry splash-back, my hands are purple, my cookbooks and camera are splattered. I experimented with saving them in syrup so that I could use them as topping for yogurt, ice cream or for baking tarts later in the year. They worked out well, and are oh so beautiful. 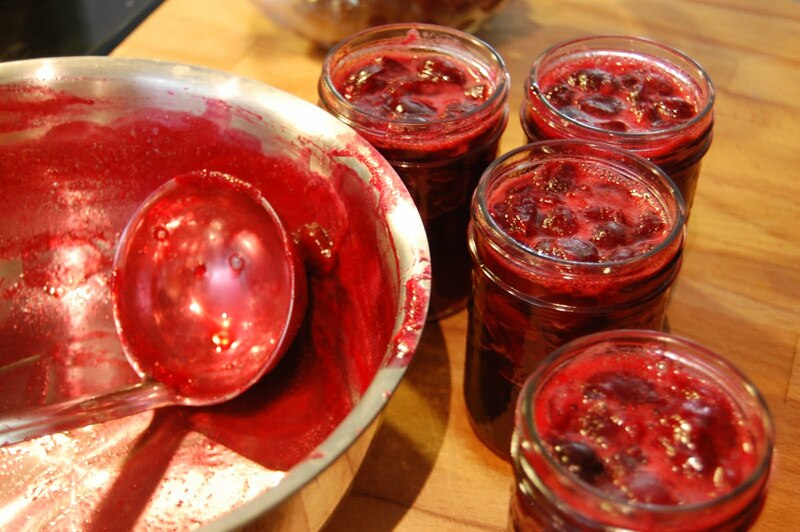 I made cherry jam, using no-sugar needed pectin, so I didn’t have super sweet jam like the strawberry I made earlier this week. 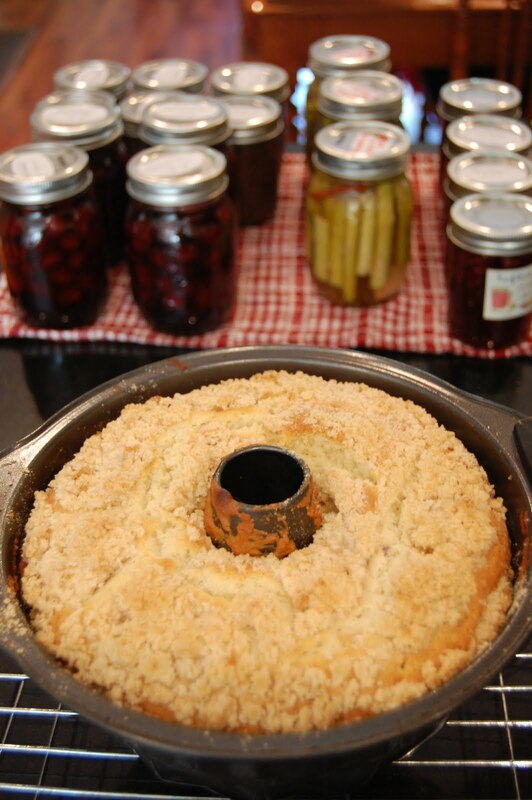 And, I made a Cherry Streusel Coffee Cake, using a Martha recipe. 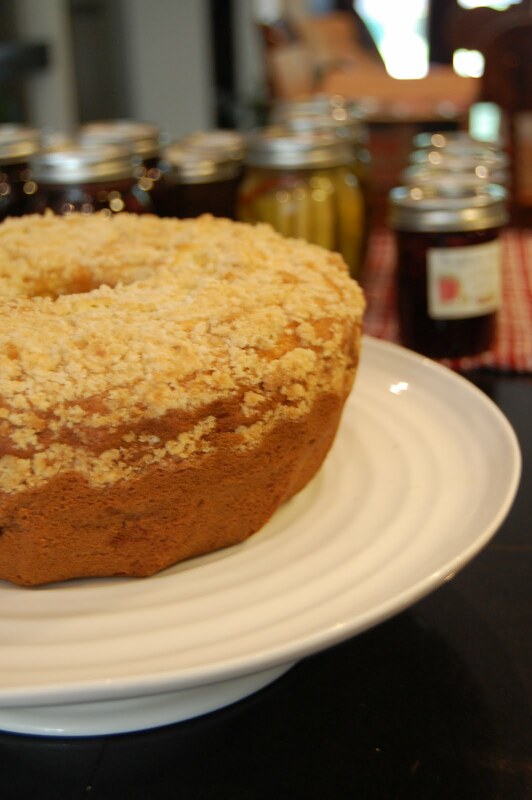 I didn’t have the right pan, Martha wanted me to use a tube pan but all I had was a bundt pan, which means my streusel topping will actually be a streusel bottoming. oops. ah well. … and…Flipped over. No one can tell, right? In the cake recipe, I needed vanilla extract. I only had some crappy artificial extract left from years ago, so I used that. My lovely friend Jacqui (co-founder of the Cross Country Baking Club), gave me a jar of homemade vanilla extract a few Christmases ago. I finally used it all up and decided it was high-time I made my own. I used rum as the alcohol because I had some from a recent trip to Cuba and think it will impart a nice flavour. The 4 split vanilla beans and 1 cup of rum will take about eight weeks to become the vanilla extract we all know and love. I’ll keep you updated on its exciting and slow progress. Meyer lemons…what a blessed fruit. A cross between a mandarin orange and a lemon, they are a bit sweeter than the regular old pucker inducing lemons and such a lovely colour. The skin is a bit thinner and a bit more yellow, they call to me every winter…eat me!…make me into deliciousness! I have a facebook group called “the Cross Country Baking Club” (CCBC) with a friend of mine who lives across the country in Vancouver. We are obsessive about delicious baking and cookbooks so we decided we would try to bake ‘together’ across the country. So every so often, we post a recipe on the facebook group and take photos and rate our results. 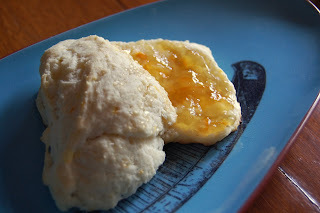 This week was my chance to use meyer lemons with a wonderful scone recipe I got from a friend. 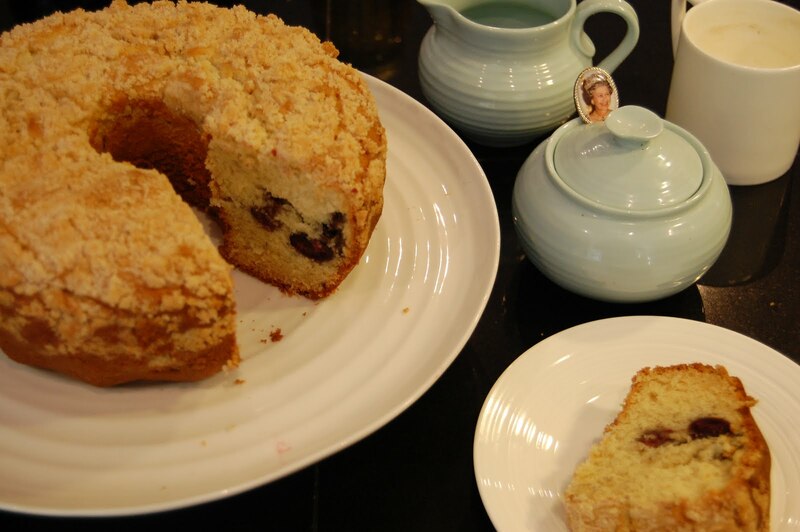 Pour a cup of tea, slather with devonshire cream (what a word – slather! ), and enjoy. *In bowl, stir together flour, sugar, baking powder, soda and salt. *Add butter pieces, and using fingertips or pastry blender, work butter into dry ingredients until mixture resembles coarse cornmeal. Leave a few large pieces to create flakiness. *Pour in buttermilk and mix with a fork until ingredients are moistened. Gather dough into a ball, pressing gently until it holds together. *Turn onto lightly floured work surface and knead briefly, and fold dough in half several times. *Gather into circle. Brush dough with melted butter and sprinkle with rock sugar. Cut into 8 triangles or use round cutter. *Bake at 425° for 10-12 minutes or until bottoms are golden and scones are cooked through.